In our increasingly STEM-centered world coding for kids is moving up into the driver’s seat. There are tons of products out there that teach hands-on coding for kids, many, however, require the use of a computer, smartphone, or tablet. 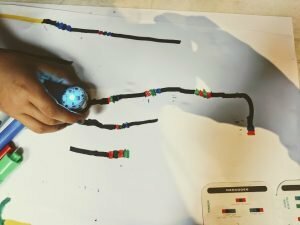 The Ozobot is unique in that you can use a computer to program it, but there are also color Ozobot codes that will let you program it with markers! Seriously, they made the Ozobot to read color codes drawn with markers or stickers! Ozobot is a small line following robot that can be programmed using color Ozobot codes or through block programming, similar to Scratch. This allows the user to control the rate of speed, turning, and direction of the robot. There are two types of Ozobot robots: the Ozobot Bit and the Ozobot Evo. The Ozobot Bit is around $50 and has all the necessary bones to do all of your programming desires. The Ozobot Evo is about twice the price and contains a few bells and whistles. For example, the Ozobot Evo has expressive sounds, can be steered with a remote control and is Bluetooth enabled. When it came to purchasing a few of these for our local BI STEM Library I choose the Ozobot Bit. The extra cost wasn’t worth the few extra features in my book. How do you program with Ozobot? Since the Ozobot is line following, all of the code must either be on the line it is going to follow or must be programmed in the block programming app. To program along the line you use Ozobot color codes. These Ozobot codes are a series of colors that tell the robot what to do. For example, when the robot encounters a succession of colors, green, black, red, it will turn left at the next intersection of lines. In this way, you can tell the robot what turns to take and what decisions to make. Between $50 and $100!?! Is an Ozobot worth it? Yes. A million times, yes. Here’s the thing with the Ozobot – you can play with it in a bunch of different ways. It can just follow drawings that kids make, it can teach programming through hands-on art, and it can teach the fundamentals of blocky programming through an app. It is easy to use, stands up to kids, and fun to watch. I love it when science and art can collide. Because the Ozobot is line following, all you need is a sheet of paper and a thick marker to get started. My three year old loved creating crazy art out of tons of colors and watching the Ozobot choose which direction to go, follow the various paths and change colors. That is one extra fun little feature, especially for little hands – the Ozobot has a rainbow of LEDs on the top. These colors will change to the color of the line it is on, so if it is on a pink line, the Ozobot is pink. If it is on a blue line, the Ozobot is blue. It is only when you “flash” the color codes, or have it run over a set of colors that flash by, does it actually program. In this way, my three-year-old found a ton of delight in being able to make the Ozobot change color. 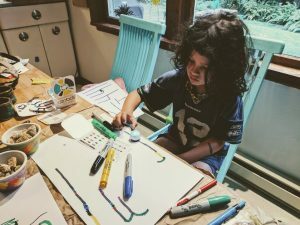 If you think about it, that is a great connection for little hands to make – if my line is a certain color, my Ozobot will be a certain color. My seven-year-old, on the other hand, had more fun trying to make the Ozobot follow a set of directions. This was frustrating for her at first since we were using the wrong markers, but once we switched to Crayola markers she has a lot more fun. She even figured out how to make it do a little cha cha! The Ozobot provided hours of fun. And that is before I made a bunch of cool Ozobot mazes and activities for them to do. You can download our Ozobot mazes and Ozobot codes stickers on our Mini Makers page for FREE! How do I program with Ozobot? What are the Ozobot codes? To control your Ozobot with codes you will need either markers, stickers, or their app (and a smartphone). You can purchase special Ozobot markers online, but I have found the Sharpie chisel black marker works great for creating a nice thick line, while Crayola markers do better for the color codes. 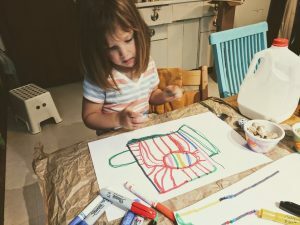 I originally bought the Sharpie pastel chisel tip set of colors and black to use for this project and my girls had a tough time coding the Ozobot. The blue sharpie was too dark and registered as black to the Ozobot. The green was too dark, or maybe too blue, I don’t know, but it also didn’t work well. We ended up switching to the thick Crayola markers for the red, green, and blue, which worked perfectly. Another option to create Ozobot codes is to purchase their stickers online. If you want a cheaper option, we have a mini-maker activity of Ozobot mazes that has a download to print your own Ozobot code stickers. You’ll just need printable 3/4 inch round stickers. Why isn’t my Ozobot following the line? Ozobots are pretty simple to get started, but there are a few tips and tricks to make the process more smooth. For example, while the Ozobot is a line following robot, it can’t sense a line that is too thin. If you draw your lines with a black Bic pen, your Ozobot won’t be able to follow them. Even a line from one of the Crayola thin (or thick) marker sets isn’t thick enough. That is why we choose to draw our lines using a chisel tip Sharpie. This makes the lines thick enough on a single pass. The Ozobot wants a line that is about 5mm thick. Too much thinner than that and it can’t sense it well, and will just start zigzagging along the line instead of truly following the line. Too much thicker than that and the sensor only sees black and will move around randomly until it finds an edge to guide it. Why isn’t my Ozobot following the Ozobot codes I write? There are a couple tricks to helping your Ozobot color codes work properly. First, if you want to tell it to turn left at the next intersection, give it a little time before it hits that intersection. Any directional codes you give it should be laid down about an inch before it actually has to perform the task. This gives the Ozobot enough time to read the code, retrieve the program from its memory, and execute the direction you gave it. It is better to be too far away from the intersection than too close. The Ozobot will remember the last code given, so you can give it a direction at the very end for a turn it will make a foot down the line. Remember, Ozobot only has storage for one task at a time. If you are using the Ozobot color codes you can only store one at a time. If you give it a long line of codes hoping that it will then turn left, turn right, go straight, turn left later, it will only remember the last direction – to turn left. Double check the markers and colors you are using. Some markers, like those we mentioned earlier, don’t work well for the color coding. Use small circles to flash your code at the Ozobot. If you change an inch of line to blue, then an inch to black, and another inch to red, the Ozobot will just think you are making it change colors and go along its merry way. It won’t think you are trying to program it to turn left. The color Ozobot codes need to happen quickly, which means drawing a small circle, about the size of a large bead, for each color.